On Sunday, March 26, Omicron Delta Kappa (ODK), a national leadership honor society, initiated nine students. On Sunday, March 26, Omicron Delta Kappa (ODK) initiated nine students. In addition, ODK initiated two resident members, Assistant Professor of Chemistry Nicholas P. Deifel and Elliott Professor of Government and Foreign Affairs John Hiatt Eastby. They also honored a member of the local community as an honoris causa member: Patrice Payne, Director of the Heart of Virginia Free Clinic. 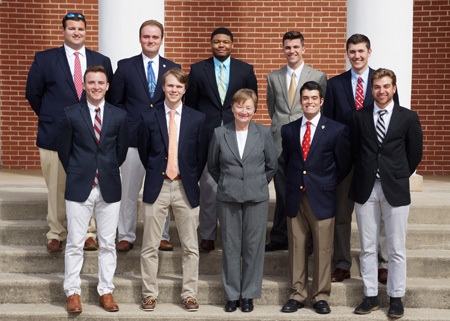 ODK is a national leadership honor society for college men and women. The Lambda Circle of ODK was established at Hampden-Sydney in 1924, and membership is a mark of highest distinction and honor. Selection of members is based on their influence as campus leaders to better campus life and to encourage high standards in all activities. Pictured: Front row, left to right: Maxwell B. Dash '18; Sean D. Walden '18; Patrice W. Payne; Alex Scott Crabtree '17; Cody W. Smith '18. Back row: Tazewell DelDonna '17; Aaron David Persily '18; James C. Turner '18; Steven Austin Dvornick '18; William S. Fussy '18.